Distinctive features: An early solar cell powered calculator, with a more efficient solar cell. It has a footprint fractionally bigger than a credit card. Size: (slightly bigger than a credit card) 54 x 96 x 5 mm (2.1" x 3.8" x 0.2"). 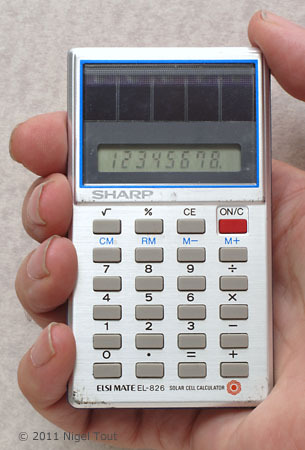 The IEEE citation "Milestones:Commercialization and Industrialization of Photovoltaic Cells, 1959-1983" says "Sharp released the world's first PV-installed [PV = Photovoltaic = solar cell] calculator EL-8026 in 1976 using PV-cell S-225. 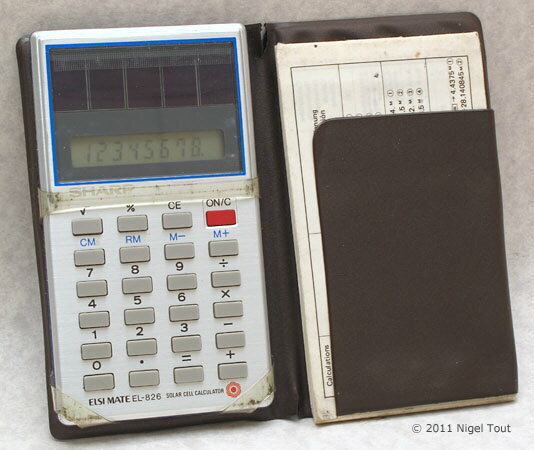 Following this calculator, Sharp developed "ultra violet" PV-cell acting on fluorescent light with much reduced surface area, which yielded a series of wallet type PV-installed calculators EL-826, EL-835, EL-838SE, and so forth, in the early 1980s". Here the calculator has been opened up. 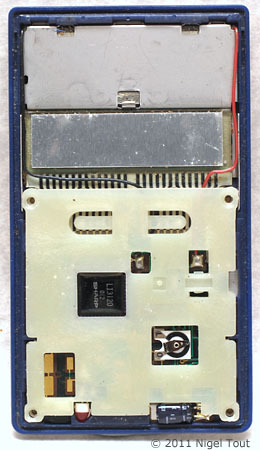 Just to the left of the middle of the circuit board is the integrated circuit, Sharp LI3120. The two small red component at bottom left is actually an LED, here functioning as a voltage-limiters to prevent too high a voltage being applied to the electronics if a very bright light falls on the solar cell. 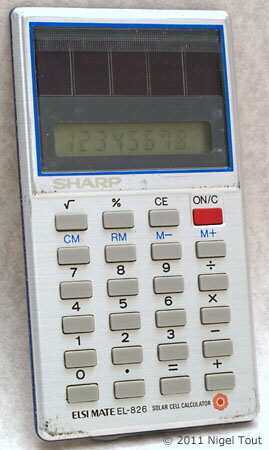 In 1976 Sharp had introduced the first calculator with solar cells, the EL-8026 "Sun Man". However, this was not purely solar powered because the calculator used rechargeable batteries and the solar cells were on the back of the calculator and were used just to recharge the batteries. The early solar cells were inefficient and so large. By increasing the efficiency of the solar cell the size of the calculator could be reduced. Also see the Teal Photon, one of the first solar powered calculators, and the Sharp EL-825 with its very large solar cell. IEEE Global History Network, "Milestones:Commercialization and Industrialization of Photovoltaic Cells, 1959-1983".